On February 14th, 2018 America was, once again, shocked and a community devastated by gun violence. The violent incident, another mass school shooting, killed 17 students and faculty members of Marjory Stoneman Douglas High School in Parkland, FL. The shooter known to be associated with white supremacist ideology, and an arsenal of dangerous weapons. Following the shooting, the community of Parkland was devastated. We watched on our social media feeds and on the news as numbers became names, and desperate loved ones discovered one they love had been lost to the violence. It took over the news cycle, we learned the names and stories of each victim. We saw photos from endless vigils and funerals. All part of a familiar cycle we don't want, and have become far too accustomed to. However, something was different following this shooting. Something we haven't often seen previously in the battle against gun violence, the survivors and victims of this shooting rallied and demanded to be noticed. And the media, and world, did. Students from Parkland organized to create direct action. A "March For Our Lives" was planned for March 24th. The action was incredibly well resourced, planned, and uplifted in a way we have rarely, if ever, seen before. The Parkland students have recognized that while some of this is due in part to the student's awareness of successful social media use and a stringent timeline, they've also acknowledged that much of it is due to their priviledged position. The Parkland students are children of the tech boom, millennials competent in the language, radicalism, and resistance of their generation. The students took critique from all sides in the days and weeks following their survival and outspoken response. They quickly adapted to the spotlight and learned which responses to filter out and which were worth holding onto. They took critiques of their power and privilege seriously and worked to make the movement more intersectional -- both in it's contents and in it's coverage. The Parkland student survivors also met and organized with student survivors in Chicago, and other major urban areas who experience the threat of gun violence at a much increased and ongoing rate. In the month proceeding the March, the young activists wasted no time. Meeting with government officials, hosting twitter chats, creating promotional content, and raising the funds needed to make both the march, and movement it has inspired, successful and sustainable. On March 24th Parkland students spread out from coast to coast, enacting their message and making their demands as visible as possible. In cities across the country Marches sprang up in organization and solidarity with the national #MarchForOurLives and #NeverAgain movements. #TheStoryteller covered events in Sioux Falls, SD and Saint Paul, MN. 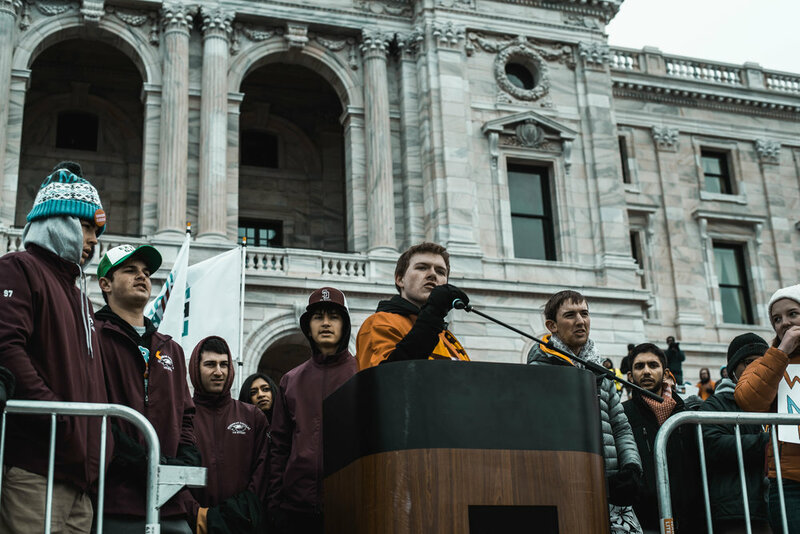 At the state capital in Saint Paul local students were joined by the MSD hockey team and other student survivors of gun violence. They stood in solidarity with hundreds of thousands across the nation as they shared stories, grief, and deep determination towards change. 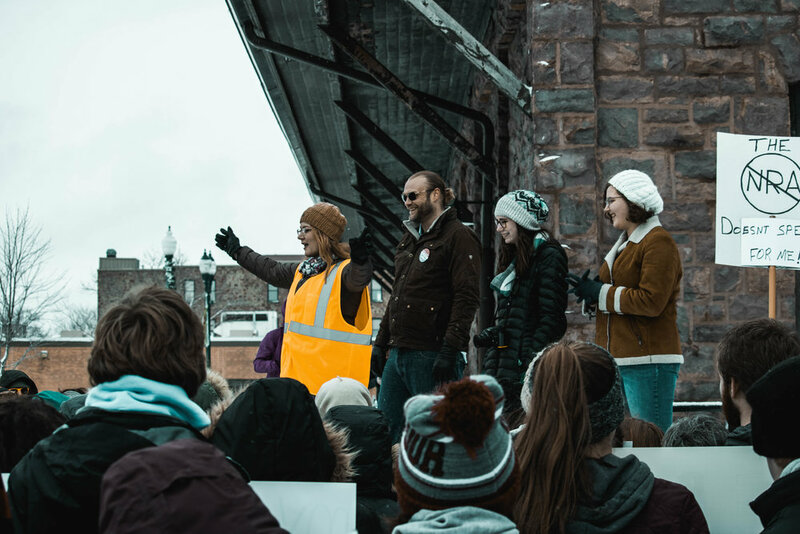 In Sioux Falls, students, teachers, and community members gathered to heed the call for schools and communities safe from the threat of gun violence. In religious and spiritual texts across history and cultures we have seen foreboding of the young people that will upheave our ugly and dangerous systems. As we watch and partake in the history unfolding before us, remember the place you stand; on the shoulders of activists and change makers from decades past, as we take up our own banners in the fight for justice, equality, and peace.